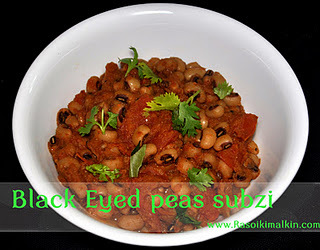 The black eyed pea,is a subspecies of the cowpea,grown around the world.This small bean has a black circular "eye" at its inner curve.Serve this tasty and healthy dish with steaming hot cooked rice and rotis. Soak black eyed peas for 6 hours. Pressure cook the soaked black eyed peas with 2 cups of water for 2 whistles and let it cool. Heat oil in a pan,and after it is heated,add chopped onion, and fry in low heat until transculent. Then add green chillies,ginger garlic paste ,saute well. Then add dhania,jeera ,masala powders fry for 1 minute. Next add tomato puree/pieces and cook until mushy,and now add cooked black peas along with water and also add salt and cook until thick.I make this a bit dry. After it is done,switch off the stove add curds,if u want it a bit thin n watery, and cilantro and serve. Super delicious subzi,love with some rotis..
Wow they looks super inviting and delicious..
wow, that looks wonderful !!! nice looks very tempting..... I generally make a different version ...with gravy and rice ,,this is something new N interesting!